Half of the FEMA-provided money is available immediately, the governor said at a press conference in Rockport. The rest will come on or before the one-year anniversary of Harvey's landfall in late August. Texas communities slammed by Hurricane Harvey can now apply for a share of a half-billion dollars in federal money that will cover everything from buying out flood-prone homes to building new seawalls and restoring sand dunes, Gov. Greg Abbott told an audience in Rockport on Tuesday. The state expects to receive just over $1 billion in hazard mitigation money from the Federal Emergency Management Agency by the one-year anniversary of Harvey’s landfall in late August, Abbott said, but half of that is available immediately. 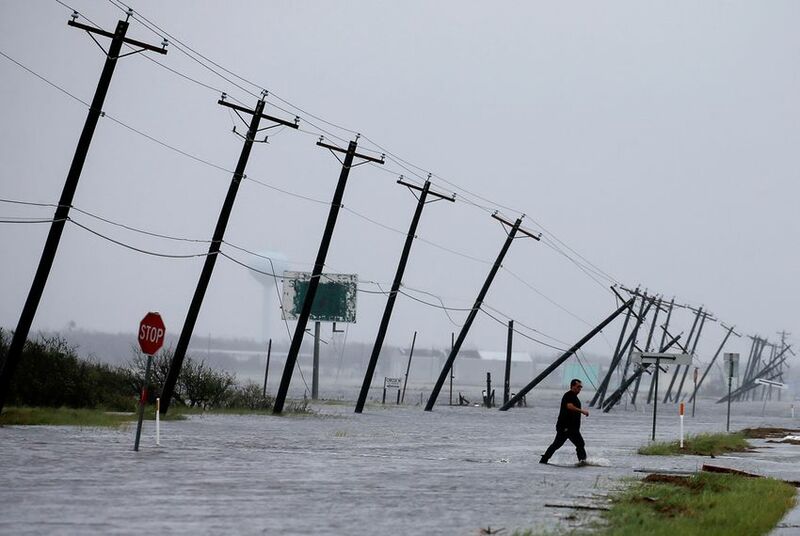 “We want to rebuild in ways that reduce the risk of future damages to property and to lives,” Abbott told a group of local officials in Rockport, which bore the brunt of Harvey’s Category 4 winds and suffered extensive property damage. Disaster mitigation money is a standard step in FEMA’s long-term recovery strategy after a natural disaster, said Kurt Pickering, a FEMA spokesman based in Austin. “The whole idea is to make the state ... more resilient next time,” he said. The FEMA money covers 75 percent of project costs. While local governments typically provide the other 25 percent, Abbott said other federal funding sources have been secured to cover that 25 percent for approved Harvey-related projects. Abbott also gave the audience an update on a long-awaited $5 billion worth of Community Development Block Grants that Congress approved in the fall for long-term Harvey recovery. Administered by the federal Department of Housing and Urban Development, the grants will cover 100 percent of the cost of disaster relief, infrastructure, economic revitalization and housing projects for both local governments and individuals. HUD has issued its rules for disbursing the money, Abbott said, and the Texas General Land Office must now issue a state plan that HUD has to approve. Abbott said HUD has promised to fast-track that process and that he expects the $5 billion to be available by the end of March. “What this $5 billion of money is for is to rebuild the houses so that everybody’s house is once again gonna be fully livable,” Abbott said. Abbott said Texas will also receive a still-to-be-determined share of the $89 billion in disaster relief that Congress passed last week as part of the federal budget agreement. He said Texas will get “tens of billions” from that allocation — the money will be divided among areas hit last year by hurricanes, wildfires and other natural disasters. That money can be used for everything from extending short-term housing assistance for displaced Harvey victims to local transportation projects, Abbott said. “This region is now going to have the funding that it’s been seeking to build long-desired projects to fully restore this region,” Abbott said.